Independent science pioneer Mike Adams was awarded a U.S. patent for an innovation that eliminates radioactive cesium-137 from the gastrointestinal tract. In his podcast, the Health Ranger answers questions about his breakthrough invention. In particular, he explains why the product is not for sale and is only meant for cases of a nuclear fallout. The Cesium Eliminator is a combination of dietary supplement ingredients including zeolites. It is the result of numerous tests done in his lab, CWC Labs. Mike Adams wanted to determine which nutrients effectively bind with cesium-137 radio isotopes. Out of thousands of substances tested, zeolites were proven to be the most effective. Mike Adams is the publisher and founder of Natural Science Journal, an open source science journal. He is the author of multiple science papers reviewed by peers and published on the journal. He is likewise the author of the first book in the world that published ICP-MS heavy metals analysis results for various foods, fastfood, spices, and dietary supplements. This book is called Food Forensics. It is the number one bestselling science book on Amazon.com. The Health Ranger is a person of color with ancestry including African and American Indian lineage. He is a Native American, and defends the environmental rights of different Native American communities. He has donated lab testing services to these communities. So, why is Cesium Eliminator not for sale or mass produced? It’s because zeolites contain aluminosilicates. That means they have very high levels of aluminum. As Adams has mentioned before, aluminum is an element to be avoided in consumption. He doesn’t want to sell his innovation because people would see it as a vitamin supplement to be taken on a daily basis. It is not a good idea to take his invention every day. Adams warns people not to consume products containing zeolites except in emergencies. People may misunderstand his invention’s intended use, which is for emergency situations only. 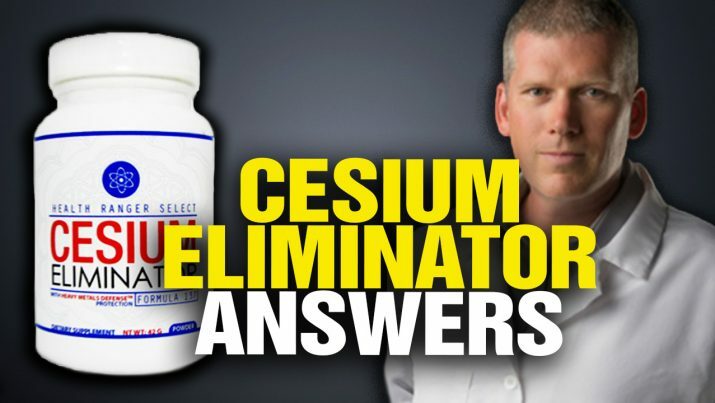 The Health Ranger has an alternative solution for people who want the health benefits of Cesium Eliminator. He says zeolites can be bought from multiple sources, but these products usually contain high levels of lead and aluminum. However, when these “unpure” zeolites are treated with another Health Ranger patented product known as “Heavy Metals Defense,” the toxic lead and aluminum compounds, along with other dangerous heavy metals, are eliminated from the digestive track. Take note that “HMD” is not as good for aluminum as it is for lead. Specifically, lead reduction is 99.9 percent, while aluminum reduction is 98.7 percent. Heavy Metals Defense is available at the Health Ranger online store. Combine one part of HMD with every 10 parts of zeolites following a nuclear fallout. In essence, the zeolites will bind with cesium-137, then the Heavy Metals Defense will mop up most of the toxic heavy metals, including aluminum, found in zeolites. This is basically how the patented Cesium Eliminator product works, but on a level more applicable to most people’s needs. Additionally, the HMD product can be used without the zeolites when a toxic heavy metal load is suspected. Detoxing from heavy metals can be difficult; contact your natural health care practitioner for guidance.